In conjunction with Positive2Work Skillnet, we are pleased to present a 2-day training programme in Supervisory Management Skills. 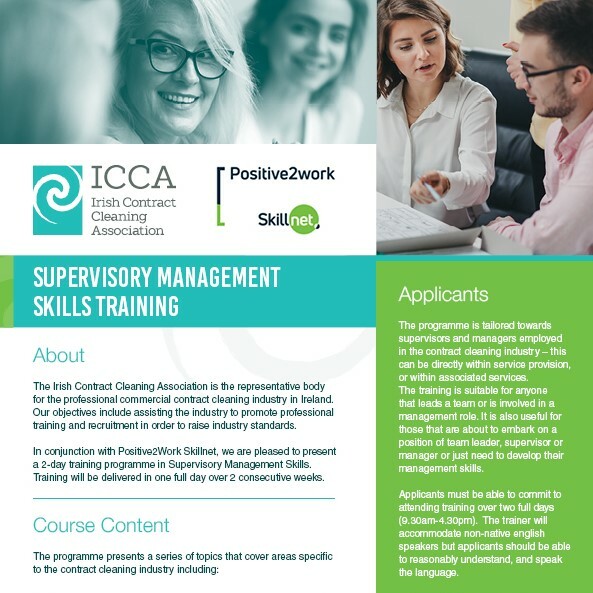 Training will be delivered in one full day over 2 consecutive weeks, from 9.30am-4.30pm on Tuesday 7 May and Tuesday 14 May in the Red Cow, Moran’s Hotel. A copy of the programme is available here. The programme is tailored towards supervisors and managers employed in the contract cleaning industry – this can be directly within service provision, or within associated services. The training is suitable for anyone that leads a team or is involved in a management role. It is also useful for those that are about to embark on a position of team leader, supervisor or manager or just need to develop their management skills. Applicants must be able to commit to attending training over two full days (9.30am-4.30pm). The trainer will accommodate non-native english speakers but applicants should be able to reasonably understand, and speak the language. Spaces are restricted to twelve places per programme. This is to afford participants time to process, and apply, the course content and skills learned. Participants will be issued a Certificate of Completion on conclusion of the course. Motivation, Qualities of an effective Leader; Your role as a manager/supervisor. Developing Team Goals; Team Briefing; Dealing with difficult team members; Communication skills – getting the message across; Motivation. Managing Time, Managing Change, Managing up as well as down. Why resilience is important. Developing emotional intelligence. Three skills of coaching, Instant results coaching. Managing performance and underperformance. Key performance management skills. The programme will be delivered by Charlie Mernagh of 2UpSkill. Charlie has many years’ experience in a management, training, coaching role and of the contract cleaning sector. He holds a Certificate in Training & Education – NUI; Certificate in Facilitation Skills and a Diploma in Sales Coaching. The cost to attend this programme is kindly subsided by Positive2Work Skillnet @ €100 per day (€200 total per person) and includes morning tea/coffee and lunch each day. To reserve your place on this programme, please email mark@p2w.ie. Applications are given on a first come, first served basis.